Monrovia Now: News and Comment about Monrovia, California: Cell Towers Going Away - City Hopes to Get Money While They're Still Needed; Fall Festival; Etc. 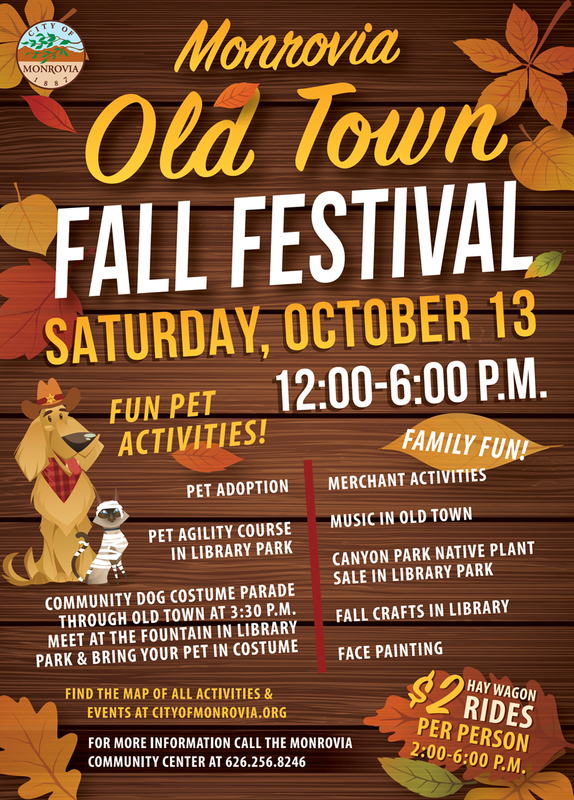 Cell Towers Going Away - City Hopes to Get Money While They're Still Needed; Fall Festival; Etc. ~ On Saturday, Oct. 13, from noon to 6 p.m., the city is hosting the Old Town Fall Festival, featuring face painting, fall crafts, hay rides, and a community dog costume parade. Questions? Call the Monrovia Community Center at 256-8246. ~ With 5G wireless technology looming, and less need for big cell towers and more need for smaller installations, Monrovia is negotiating with AT&T and T-Mobile to see if they'll buy out their contracts to use the tower at the Police Department (though they can cancel the lease for any reason with no penalties). That would let the companies use the tower at less cost while they still need it yet would give the city two lump sums of $200,000 to 250,000. Also, the city is working to streamline its process for permitting future 5G wireless small cell devices. ~ The Monrovia Historic Museum has had a problem with moisture and flooding in its basement, so the city is going to do some repairs to prevent the problem beginning Oct. 8. ~ Monrovia Fire Department will hold Fire Prevention Week activities from Oct. 8-13. On Saturday, Oct. 13, the Department will open Station 101 (141 E. Lemon Ave.) between 10 a.m. and 2 p.m. There will be a Junior Firefighter Challenge, designed for kids to simulate firefighter drills, and firefighters will perform an auto extrication demonstration. Also, firefighters will visit all Monrovia Unified School District fourth grade classrooms. ~ There will be a Lyft Tutorial for Older Adults at the Monrovia Public Library Community Room today, Oct. 3, at 4 p.m. A light dinner included. Questions? Call Angela Cho at 932-5528. 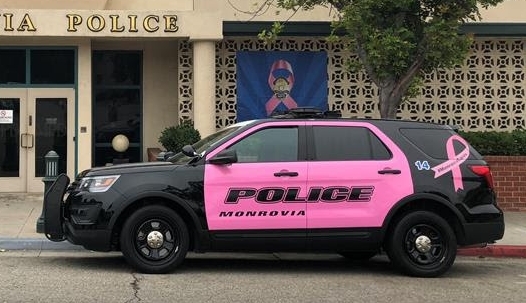 ~ In support of the Pink Patch Project the city had one of its police vehicles wrapped in pink. The point is to publicize life-saving benefits of early detection and intervention in the fight against breast cancer. Also, funds raised from the sale of Pink Patch Project items go for research, treatment and education to find a cure for breast cancer. ~ See all the "Footnotes" sidewalk poetry here (https://goo.gl/jEMR6n) The latest poem is by Gayle Montgomery, and has been installed on Lemon Avenue between the Fire Department and City Hall.